The English Football Association is charging Mario Balotelli after an Instagram post the soccer star claimed was "anti-racist with humor." "Mario Balotelli has been charged by The FA in relation to a recent posting on social media," read the statement. "It is alleged the Liverpool player breached FA Rule E3 in that his posting was abusive and/or insulting and/or improper. "It is further alleged that this is an 'Aggravated Breach' as defined by FA Rule E3 as it included a reference to ethnic origin and/or color and/or race and/or nationality and/or religion or belief. "The player has until 6pm on 15 December 2014 to respond to the charge." 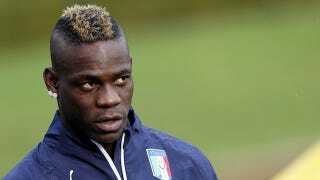 Balotelli will likely face a disciplinary hearing as a result of the charges, and could potentially face a ban over the post.